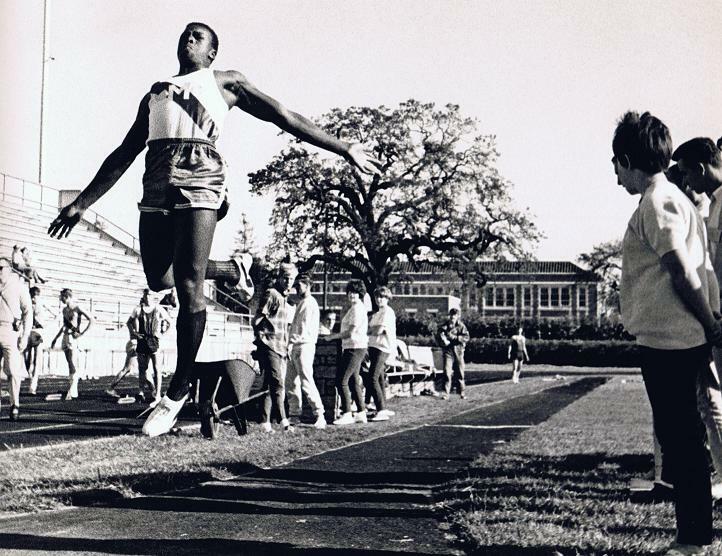 When it comes to who was the best long jumper for the Redwood Empire, there is no gray area. Now the Empire has had other greats, going all the way back to 1900 when Ukiah’s Arthur Henley spanned a state best at 22-3½. That stood as the Empire record until 1939 when Sonoma Valley’s Frank Freeman went 23-10 and earned 2nd at the state meet to tie our best LJ place ever at state first done by Vallejo’s Elmer Boyden in 1921. 24-3¼ as a junior, including 4th at state and then in 1967, as a senior, he had at least six jumps over 24 feet including a 2nd place at state and an invitational mark of 25-7¼ with an over the limit wind. The long jump, unlike any other event I know of, has an amazing 24 different jumpers on the top 50 list. But Gray has 22 of those marks, with no other jumper having more than three, while most have only a single jump on the list. Sonoma Valley’s Dan Littlefield is the one with three leaps over 23 feet and he also picked up a 4th at state. But all ten of the 24 footers were all by Gray. Since Littlefield, only four jumpers have made the list this millennium.